This one's pretty old. It was more an art project than a Halloween one - I did it in art class in high school. The understructure was wire (not chicken wire), and the covering was paper mache. It was built to sit over one of the drains from the top of our house, and was hollow all the way through, so if I put a fogger on the roof behind it, the fog would pour out its mouth. The eyes were also hollow, so I could slip a light stick in. The actual piece never got used much; the paper mache was fragile. It did look good on the house, though! 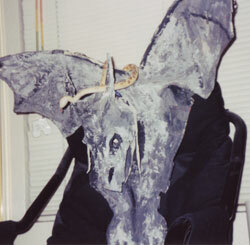 I might try making another gargoyle similar to this. I wouldn't use the same technique, though. I'll probably try building the base out of chicken wire, and using a more durable material (like latex) for the 'skin' of the gargoyle. Sadly, I can't get any better pictures of this one, as it is no more. The paper mache lasted pretty well, but ultimately, it couldn't handle being moved about too much. Still, the idea is a good one - someday the drain gargoyle will be rebuilt!